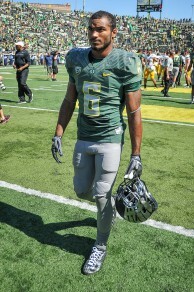 One of the most amazing aspects about this year’s Oregon team has been their ability to overcome injuries. Lost to significant injuries this season have been starting left tackle Tyler Johnstone, starting right tackle Jake Fisher, primary backup offensive tackle Andre Yruretagoyena, starting wide receiver Bralan Addison, running back Thomas Tyner, starting tight end Pharoh Brown, All-American cornerback Ifo Ekpre-Olomu, and most recently starting receiver and return man, Devon Allen. Imagine Duck teams in the past losing this kind of talent and depth to injury. In the 2011 season opener against LSU, Oregon quickly realized they only had one player playing the receiver/slot position quick enough to create space versus LSU: true freshman D’Anthony Thomas. Imagine if that team had lost Thomas as well as another starting receiver, Josh Huff. We would have been left with Lavasier Tunei and Justin Hoffman. Now take away starting linemen, Darren Weems and Mark Asper. While the 2011 Duck team was great, it didn’t come close to the depth of the 2014 / 2015 version. This year, the Ducks were able to replace those players with elite players like Dwayne Stanford, Darren Carrington, Charles Nelson and Trell Crosby (arguably the Ducks most improved player). The improved depth has been due to one thing: recruiting elite classes of fresh talent year after year. With National Signing Day a mere 26 days away, the Ducks have their eyes on a number of elite non-committed recruits. Which single uncommitted recruit could help assure that the Ducks continue to produce this kind of depth and talent next year? With Oregon losing 3/4 of its staring secondary next year, the answer is obvious: 5-Star Prospect of Long Beach Poly High School in Long Beach, Iman Marshall. 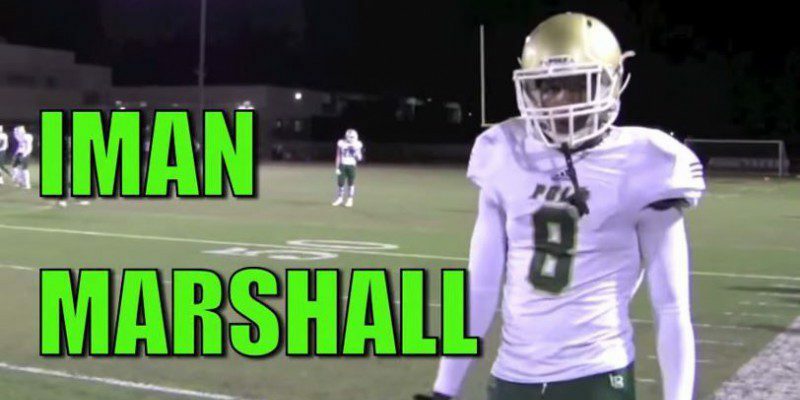 The 6’2″ 195 lb Marshall is listed the # 4 overall recruit in the country by 247Sports and as an elite corner back by major recruiting services including Rivals (#1) , Scout (#2) , ESPN (#2) and 247Sports (#1). Marshall will pay an official visit the Ducks on the weekend of January 30th. Marshall announced today he is also set to visit LSU (1/16), Michigan (1/19) and Florida State (1/23).